ON SALE ITEMS ( 9840 ) ::: Furniture for the Home, Office, Home Office, and More at Pure Design Online! Karim Rashid designed the ARP Stool for Pure Design of Canada back in the early 1990's, and it was an immediate success due to the combination of the simple legs and the sensuous and supportive wavy seat form that has been a trademark for Karim throughout his design career. After several years out of production, Offi has re-introduced the ARP to the market. 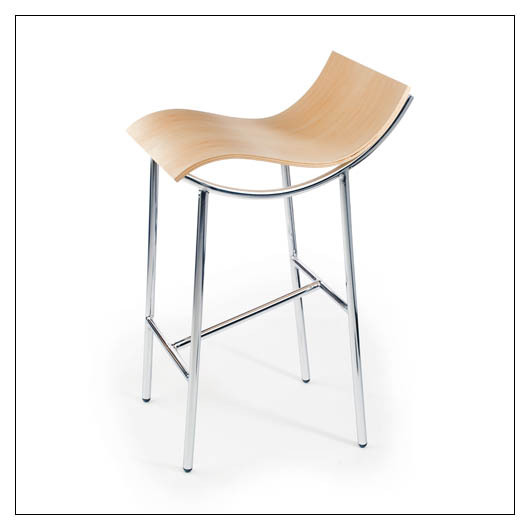 It is now only available in counter height (24") with two natural plywood finishes and the chrome leg structure. A version of this product is available at a significantly discounted price on the Pure Design Basement site. Note that items from The Basement often have cosmetic flaws of some sort, and are not returnable. See The Basement site for complete details.